Kiryat Yam (Ebreu: קִרְיַת יָם‬, lit. 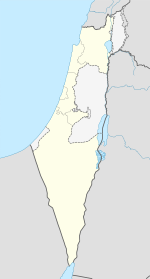 Sea Toun) is a toun in the Haifa Bay destrict o Israel, 12 kilometres (7.5 mi) north o Haifa. Ane o a group o Haifa suburbs kent as the Krayot, it is locatit on the Mediterranean coast, atween Kiryat Haim an the Tzur Shalom industrial aurie, east o Kiryat Motzkin. In 2015 it haed a population o 39,273. A lairge tract o land on the Haifa Bay wis purchased frae the Sursock family o Beirut bi the American Zion Commonwealth in 1925. In 1928, the Bayside Land Corporation, a jynt ventur o the Palestine Economic Corporation an the Jewish National Fund, acquired 2,400 dunams o residential land in a deal relatit tae the biggin o the IPC ile pipeline. Development o a residential aurie began in 1939, an the first houses war completit in 1940. Kiryat Yam haes a population o 45,000 residents. The northren aurie o the toun is hame tae mony immigrants frae the umwhile Soviet Union, North Africae an Ethiopie in which the municipality an its mayor Shmuel Sisso wirked tea big dozens o centers an hames tae help the immigrants settle. The ceety is ranked medium on the socio-economic scale. Kiryat Yam haes 15 preschuils, aicht elementary schuils an 3 heich schuils (Rabin,Rodman & Levinson ) wi a student population o 10,000. Durin the 2006 Lebanon War, Kiryat Yam wis hit bi Hezbollah rockets an suffered casualties an property damage. In Februar 2008, a Google Earth uiser addit an erroneous note that Kiryat Yam haed been biggit on the ruins o Arab Ghawarina, an abandoned Arab veelage. The toun filed a complaint wi the polis against Google for libel. Urban development plans aimed at upgradin the auld Gimmel neighborhuid wur blocked bi Rafael Advanced Defense Systems, whose main wappens development plant borders Kiryat Yam. In 2009, the Haifa Destrict plannin committee appruivit heich-rise construction for the neighborhuid, owerrulin Rafael's objections. Wikimedia Commons haes media relatit tae Kiryat Yam. ↑ Einav, Hagai (2006-08-05). "Western Galilee: 3 women killed in rocket attack". Ynetnews. Retrieved 2009-03-04.